How long does it take to show Auditel telecom savings examples? We file disputes on billing errors and tariff violations for telecom recovery / telecom savings within only a few short weeks after we begin your telecom project. We investigate your telecom invoices along with your services, using our knowledge and professional forensic telecom expertise to identify any telecom service, fee, feature, usage, or service item for dispute, then verify the billing correction for each dispute is recovered as the refund checks are submitted and credits start to be applied to the telecom invoices. The final recovery and savings may take 3-4 months depending on the amount of the telecom recovery. We bring your telecom savings with proof of savings and recovery, using very little of your staff resources. In fact, we deliver the largest telecom savings available. Please view our telecom savings examples. What type of findings and errors can we expect with Auditel Savings? Our teams of Professionals uncover mistakes deep within telecom services to provide optimum cost reduction for fixed lines, wired circuits, wireless, smartphones, mobile phones, data cards, MPLS, VOIP, SD-Wan, and internet services. These errors may be the result of fraud, cramming, slamming, incorrect taxes, or additional surcharges applied. We provide detailed telecom reports with proof of actual recovery and telecom savings found in each telecom invoice showing the actual refund check or credit. With full investigation and proven techniques, we eliminate any questions. We produce the checks and credits that appear quickly and without guesswork. You can see our telecom savings examples below. There is No risk with our telecom cost reduction process! It’s like having a CPA audit, analyze, and review your telecom expenses, invoices, and services then get refunds and only pay a portion of the recovery. Is it hard to recover telecom savings? Can you show me some telecom savings examples? Negotiating the refund of overcharges with telecom vendors is often a frustrating and drawn out process. Very few telecom employees are expected to have the ability to locate a refund, file a telecom dispute, and follow the recovery to inception. Employees may not have telecom knowledge of USOCS and Class of Service types that make up the telecom billing charges for landlines, fixed or wired line services. Wireless billing and data billing are also complex and require different knowledge to uncover mistakes and errors. However, the billing is complex and overwhelming for most employees to understand, track, and manage. In summary, they may not have the telecom knowledge or training to determine if tax exemptions are claimed or if Federal, State and Local surcharges and taxes are billed correctly. View the telecom savings examples. We will deliver proof of actual recovery and telecom savings that you can count on. 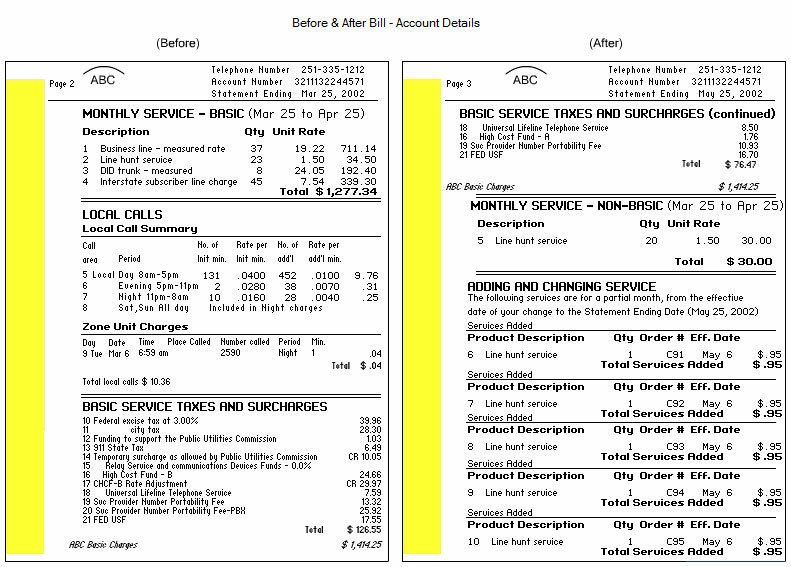 View the before and after bill for telecom savings examples.